Presidents' Day (commonly known as Washington's Birthday)is a United States federal holiday celebrated on the third Monday of February in honor of George Washington, the first President of the United States. This February holiday has become a day well known for sales in many stores. From February 17th- February 21st, we are going to join in on the celebrations and offer sales, free code-giveaways, Transfer Bonus and more! Weekend Sale(2/17-2/21): Check the President's Day Sale tab, for special 25% off on certain Item Mall items and some new exclusive sale items. Free Code Giveaway(2/18-2/20): Free codes will be given out via server wide announcement every hour. Codes can be redeemed at Gato NPC ingame, each code is good for one(1)prize, first to enter code earns prize. Codes will be a mystery Prize ranging from EXP potions, Gold Pouches, and even a few codes worth 1000gp! Transfer Raffle(2/17-2/21): Each transfer of 1000 or more during event period will earn 1 raffle entry to win a Pretty In Pink MyHome Package. 5 winners total will be chosen during maintenance Tuesday. This week we've had a couple Special Maintenance, and will be having one additional maintenance tomorrow(2/10) between 10am and 12pm (exact times of maintenance will be announced ingame and on the forums). As a special thank you for you patience during this slight down times, we'll be hosting 2 special happy hours this weekend! Happy Hours will take place Saturday and Sunday from 4pm-9pm PST! During this time we'll be double on all channels! Make sure to be logged in and leveling during these times to take advantage. Trouble in the Cookie Factory! The Cookie Factory is reopening its doors for the Valentine’s Day Holiday season, February 8th, 2012 – February 21st, 2012. They've done some remodeling, so it’s all brand new! Only one slight problem… Team Chocolate Robbers and Team Anti-love have taken over the cookie factory are trying to prevent cookie factory from making their world famous chocolate for Valentine’s Day. These two-gangs hate Valentine’s Day, and anything related to love, you’ll have to make your way through the factory and show these gangs how to love! 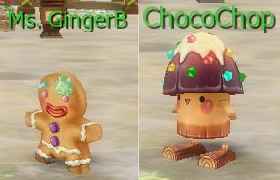 •	Mrs. GingerB and ChocoChop pets will be returning in the Valentine Event Egg for 200pts. Start your Adventure in Port of Winds from NPC-Rony. Love is in the air...well almost...Valentine's Day is coming up shortly, so we want to give you all a chance to show off how much you love that special someone, Or just how much you love Dragon Saga in general. Create a Dragon Saga loading screen, featuring you and your loved ones or things you love about Dragon Saga and you might just end up being one of the lucky chosen to be showcased ingame! 10 of the Loading screens will be chosen by the GM Team to be added ingame for the rest of February! -Make sure to leave a blank space on the bottom for us to add the loading screen bar. -Check out the samples here. Deadline will be Feb 8th 6pm PST! Good Luck All! Click to submit your loading screen. The Dragon Fellowship is once again looking for the best of the best to enter the: Tournament of Dragons. The September and October edition of the Tournament of Dragons had heroes facing each other in 1 on 1 battle of varying levels. This time teams of heroes will battle each other for glory and cash prizes too!! Test your might against 15 other teams to see who the toughest Heroes on Vyvern are! 15 Teams of 4(1 alternate is allowed) who register on a first-come, first-served basis on the official Tournament Registration thread. All participants must have a valid Dragon Saga account and forum account all in good standing (if your WarpPortal account or your forum account is banned, you will be disqualified). Vyvern Server, Free Class PvP, in rooms specifically created and supervised by the GM staff. Players will be invited to the room (via ingame mail) when the time comes, so ALL PLAYERS must be available at their appointed/scheduled match time (Unless stated otherwise by the GM Staff). To participate in the event the Team Captain must create a post in this thread with the names of 4 Team members and 1 alternate. A total of 5 names per post. Don’t forget to include your team name. This thread will remain locked until registration begins Friday January 20th at 5pm PST. REGISTRATION ENDS 10PM PST Friday February 3rd! * Prizes may be exchanged for Estimated Retail Value in Dragon Saga Points. Winners will be contacted via forums on instructions for claiming prizes.